I started this series two months ago, but here’s the final project that goes with the Things They Carried: Truth and Storytelling Unit. 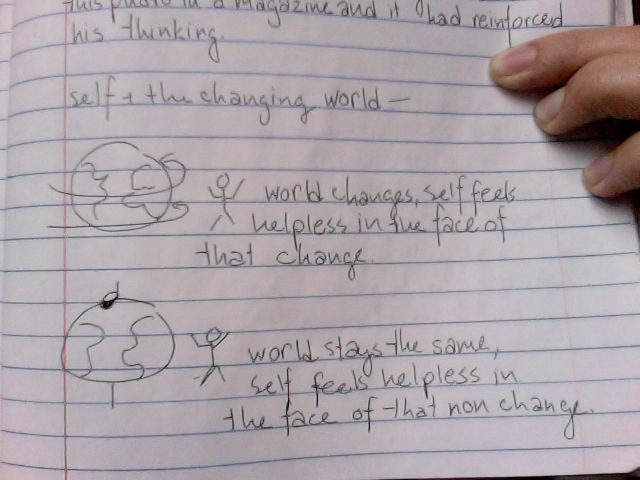 What is the relationship between the self and the changing world? You will do this by writing an essay that is both analytical and narrative. The analytical section really just reinforces the writing skills we’ve been working on all quarter with the 2Fers — and students see this. The narrative assignment, though, really blows things wide open. I emphasize that, while you can focus on death or trauma (and many students do), there are so many lessons embedded in the book about the self in the face of x y or z change. I also rely on lessons from Peter Elbow to get these ideas really flowing from students — not always easy after a few months of mostly analytical composition. Students write about the acute anxiety of transferring schools, or refusing to watch a loved one die in the hospital; to be intensely attached to every item in a care package sent to summer camp, or to have an anger that they bank down inside them, only to have it seep out at unexpected moments. This entry was posted in SLA, Uncategorized, Unit Plan, Writing and tagged Analysis, Narrative, Personal Writing, Peter Elbow, The Things They Carried, Tim O'Brien, Writing, Writing Without Teachers on January 8, 2013 by lpahomov.